I own a couple of pretty aprons already and though they may look cute, they really aren’t functional in the kitchen. I wanted an apron that was both stylish and useful! The point of an apron is to protect your clothes while you are in the kitchen right? 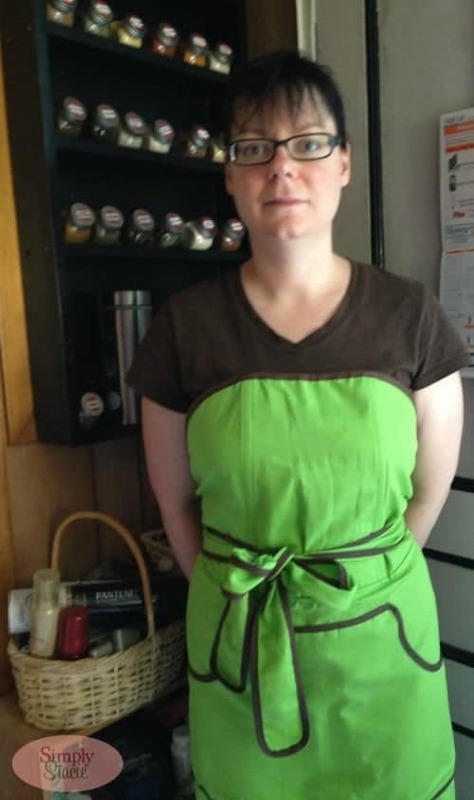 I’ve finally found an apron I adore and that fits my needs: the Nytta Design Party Apron sold by Cilantro Cooks! They are based out of Lunenburg, NS which is in my neck of the woods. There’s a few unique qualities about this particular apron that I wanted to mention. First off, there’s no shoulder straps! It’s simple to put on and ties around the waist. The bodice stays put and doesn’t fall down. The fabric is 100% organically grown cotton and is sturdy so it stays in place. I love not having to tie anything around my neck and if you’re hair is done up, putting this apron on will not ruin your ‘do. It also has a beautiful design. It has a boned upper part and decorative bands. There’s long bands to wrap around your waist and finish in a pretty bow. It’s tailored to fit most body types from Small to XXL. I found it very flattering and I felt awesome wearing it. No frumpy apron here! If you prefer you can also fold down the upper part of the apron and just wear it from the waist down. I prefer it the other way though with bodice. It also has a large front pocket you can use to stash things while you are busy in the kitchen. I kept a dish cloth in mine to wipe my hands as I was cooking. It’s a Swedish design and made in Europe. I always associate Sweden with having cool looking furniture (hello IKEA) and funky designs. Now, I’ll also be thinking of that they make pretty awesome aprons too! 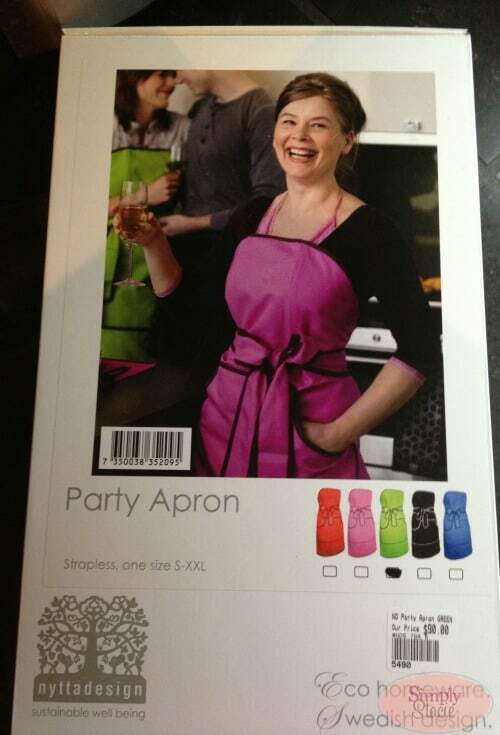 My Party Apron is green with brown trim, but Cilantro Cooks also sells them in other colours. They are also available in black, blue, pink, and red. In terms of cleaning, it can be machine washed on 40°C in a laundry bag. Don’t add fabric softener and hang it to dry. If you want to iron it, use steam or a medium warm iron and iron only the backside. The Nytta Design Party Apron costs a little more than a regular apron. 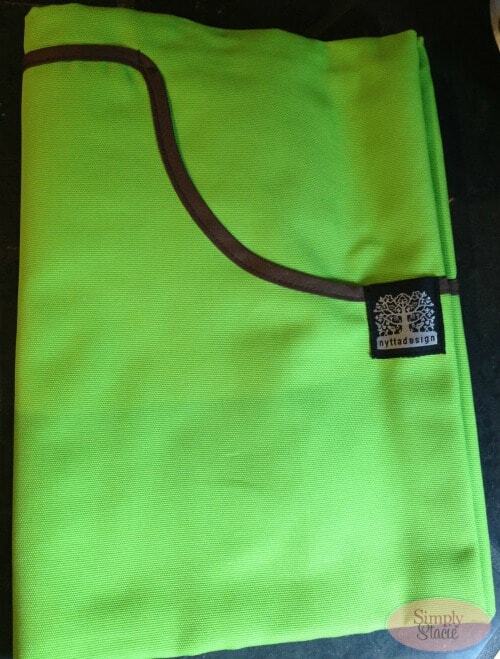 However, it’s a higher quality apron made out of 100% organic cotton. Plus it’s fun and cute and I think worth the little bit extra. I enjoy wearing mine. You can purchase it for $90 on Cilantro Cooks. Plus, Cilantro Cooks offers FREE SHIPPING for all orders over $100 in USA & Canada. Pay by either Paypal or a credit card. Now when I have people over to entertain I’ll have something fun to wear! I want a prego mini dough press. Well, and about 100 other nice kitchen gadgets. I like the lodge 12″ preseasoned skillet. I would like to get the heart shaped bundt pan. love to get an expresso maker! I absolutely adore the ‘Carolyns Kitchen Petit Party Dot Apron’ ! I would love the Emile Henry Pizza Stone in red! I would love making homemade pizzas using this! 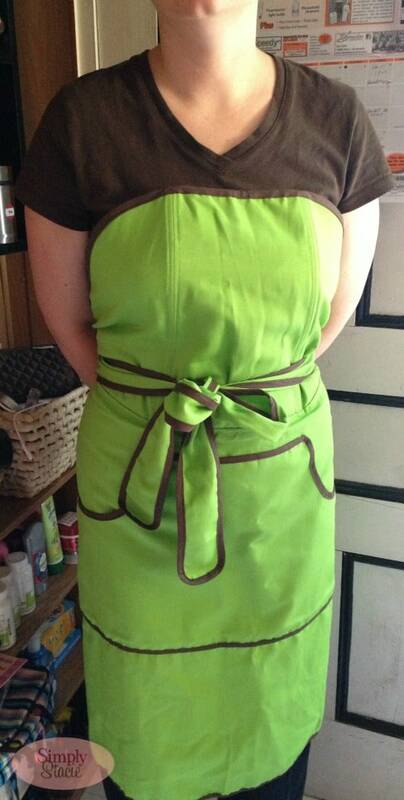 Thank you for the chance to win this beautiful apron. I also like the Oxo Baking Set! Love the heart shaped pan! I’m on my feet all the time, so I would love something like the Anti-Fatigue Kitchen Mat. How about a new kitchen? Love the nordicware seashell bundt pan! I love the Carolyns Kitchen Bathing Beauties Pink Apron! Oops! That’s not AT ALL what I meant to say! Another product I would like is the Emile Henry individual lasagna dish. I love the OXO Good Grips Cookie Press! I could use the Marcato Atlas Blue Pasta Bike. I like the ROK expresso maker!!! I like their Bake-a-Number Cake Pan. I like the Cuisinox Set of 3 Stainless Steel Canisters.